(http://constructorsrg.com/page2.html) and a set of bar ends from www.barender.com to make a very nice set-up. 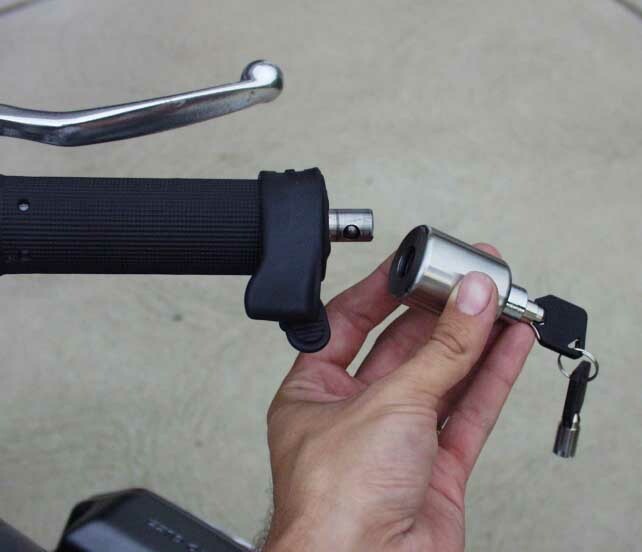 The right side end weight comes off with a lock to allow locking your helmet to the bars since Guzzi places their helmet locks in a very POOR location. 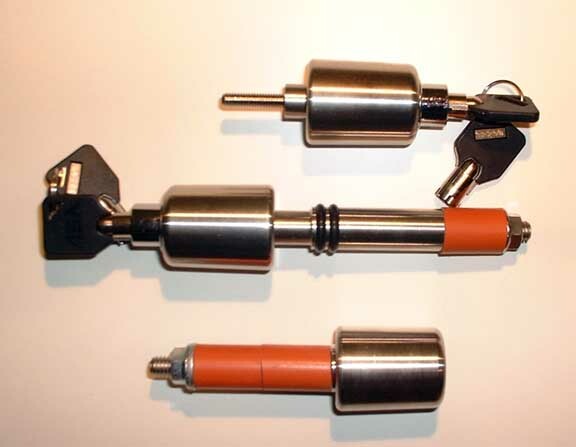 I used the universal lockset that comes with one lock and one dummy end weight. The 7/8" set would also work. I turned a groove in the left side dummy weight to mount the mirror. 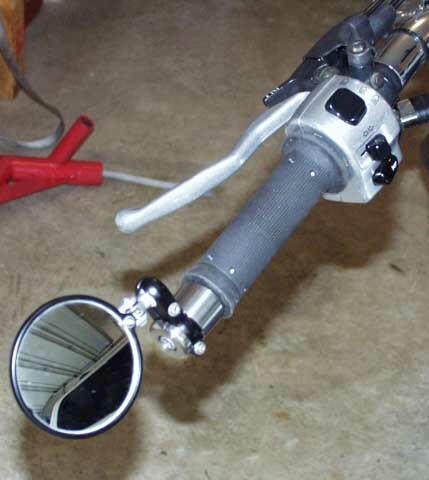 You cannot mount a mirror to the locking head since it does spin. 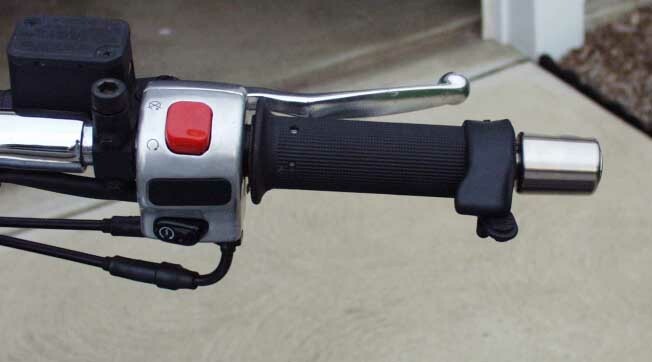 That is, the piece in the handlebar stays fixed, but the head will spin once locked on. I also took the chance to upgrade to Pro Grip Model 842 grips. These can be purchased from www.denniskirk.com under part number 59-2441. These are grips for 7/8" bars. Even though the newer Guzzi’s have 30mm bars, the ends still accept 7/8" sized stuff. To use these grips, you WILL have to cut the ends out of them, as they are closed end. Note, if you want to use these grips without end weights and leave the grips with a closed end, they will be too short! Cutting out the ends gives them the proper length and then requires you to use end weights unless you want to ride around with big holes showing. 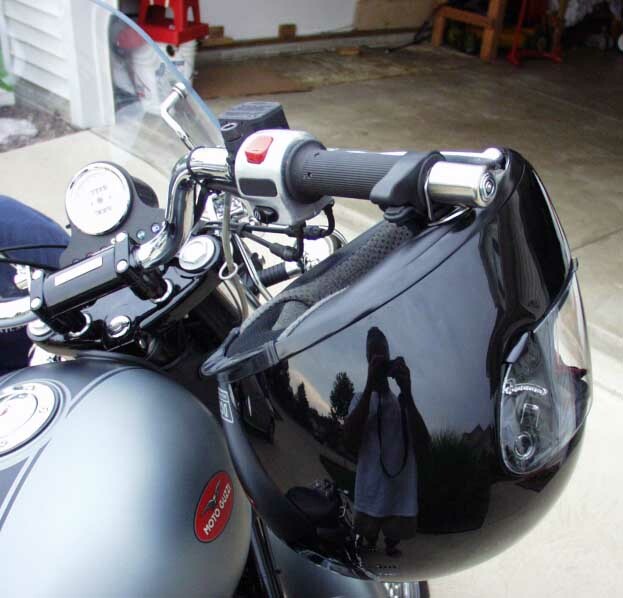 I used Griplock brand adhesive (www.denniskirk.com part number 30-1512) to install them. This is some nasty sticky runny stuff. Use very sparingly and have some solvent nearby to clean up excess. Also, work with it very fast as set-up time is very short. 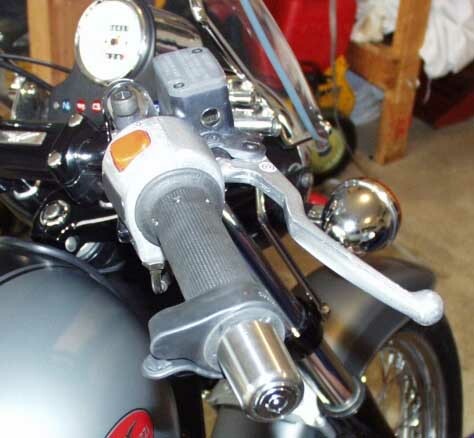 Also, it is recommended that you use a new throttle tube as it is almost impossible to remove the stock grip off of the existing tube. Also, people who use these must be sure to NOT put a washer between the nut and the orange rubber bushings or they will never tighten up as the nut will just spin on the washer.